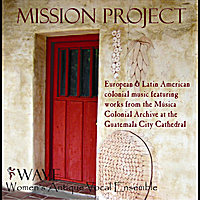 European and Latin American colonial music featuring works from the Música Colonial Archive at the Guatemala City Cathedral. Recorded live from performances in California Missions. The European colonies aren’t thought of as being rich sources of repertoire, but in the past few decades a vast wealth of music has been found in Latin American cathedrals. Compositions by Spanish, Italian, Portuguese, and colonial composers have been found in the archives of cathedrals in Mexico City, Puebla, Oaxaca, Guatemala City, and many other Latin American cultural centers. These editions provide clear evidence that there was an exchange of culture that occurred between Spain and her colonies, which later formed a foundation for the music played and sung in the California missions. During the reign of the Catholic kings at the end of the 15th century, Spain had its own musical culture. This style crossed the Atlantic with Spanish and Portuguese missionaries who hoped to convert the Native American Indian tribes and African slaves in the New World. This transition of Spanish musical culture into the existing culture of Latin America resulted in the displacement and appropriation of much of the indigenous Indian music. Colonial and Spanish-born composers in the New World not only wrote in the more traditional Spanish forms of composition but also created new forms of musical expression incorporating the Creole, Mestizo, Indian, and African musicians’ own melodies, rhythms, languages, and texts. Most of the compositions on this recording are taken from the Música Colonial Archive, a 10,000- page manuscript discovered in Guatemala’s main cathedral after an earthquake struck in 1976, which contains music from the 16th to the 18th centuries. Among the collection of composers represented in this archive are renowned masters from the time of the Golden Age of Spain such as Cristóbal de Morales, Tomás Luis de Victoria, Francisco Guerrero, Sebastián Durón, and José de Torres y Martinez Bravo. Even Giovanni Pierluigi da Palestrina, who was born and lived his entire life in Italy, is represented in this archive. The archives also reflect the superb talent of distinguished colonial musicians such as Hernando Franco, Juan García de Zéspedes, Juan de Araujo, and Juan Gutiérrez de Padilla, among many others. Published in Lima, Peru, and believed to be the first piece of polyphonic music printed in the Western Hemisphere, Hanacpachap cussicuinin is part of a compilation of Peruvian music entitled Ritual Formulario, which was assembled by a Franciscan who spent 40 years ministering to the descendants of the Inca in Peru. Pachamama was, for the Inca, the great life-giving Mother who loved and took care of all her children’s needs. Missionaries made much of her similarity to the Virgin Mary and transformed this work from a processional to honor Pachamama to honoring the Virgin. The complete version consists of 20 verses and the text is in Quechua, the imperial language of the Inca. Spain was deeply influenced by the music of Cristóbal de Morales and, as a result, his works formed the basis of, and had a most lasting influence on, music performed in the New World churches and cathedrals. Together with Tomás Luis de Victoria and Francisco Guerrero, he is recognized as one of the three most important Spanish composers of the 16th century. Missa sobre las voces is one of Morales’s works for which there is no other source than the Guatemalan archive. This mass is based on the hexachord ut, re, mi, fa, sol, la, which is immediately evident in the first vocal entrance of the Kyrie. Tomás Luis de Victoria’s O vos omnes is a church responsory from the Book of Lamentations. It was used by the early church to portray the suffering endured by Christ at his crucifixion. The intimate nature of the text is conveyed brilliantly through textures and text painting. This sense of austerity, intimacy, and simplicity combine to create a deeply moving musical expression of the written word. Morales and Victoria spent much of their time in Italy and composed only sacred music, while Francisco Guerrero, who composed both sacred and secular music, lived and worked primarily in Spain. He was able to compose in an amazing variety of moods, from dance-like joy to solemn devotion to deep despair. His compositions were some of the most popular in Latin America and were found throughout the cathedrals in the New World. Guerrero wrote so many beautiful motets on texts praising the Virgin Mary that his contemporaries called him ‘El cantor de Maria.’ Included in these Marion motets are several Salve Regina settings. The setting on this recording can be found in the Música Colonial Archive. Missa quarti toni is a remarkable four-part mass probably composed in the 17th century. The manuscript of this work is attributed to ‘El Maestro Alegre,’ which some scholars believe may refer to the Italian composer Gregorio Allegri. Allegri was a priest, singer, and composer, and in 1629 he was appointed to the Sistine Chapel choir, where he worked as a singer until his death in 1652. The great Italian composer Giovanni Pierluigi da Palestrina was, along with the Spanish composers, greatly influenced by Franco-Flemish music. He was without doubt the most popular non-Spanish composer in the New World. His Salve Regina is one of the very few works by a non-Spanish composer to appear in the Música Colonial Archive and is one of numerous other settings of the same text found in the archive by New World composers. In the version performed on this recording, the top line consists of diminutions on the melody played on cornetto with the lower three voices played as written on violin, viola da gamba, and archlute. Sebastián Durón was born in Spain but, as a result of being exiled during the War of the Spanish Succession, lived mainly in France for the rest of his life. His compositions are an international mixture of many different forms including zarzuelas and villancicos, operas, cantatas, sacred music, and solo works for organ, voice, and violin. He was criticized for corrupting Spanish music with foreign influences, but nonetheless he was widely admired in his own time and his works are found in all parts of the Spanish-speaking world. Negliya que quele is a Christmas villancico in Mexican-Creole dialect. With unsurpassed joy the black Mexican slaves dance and sing as a gift to the newborn King. José de Torres y Martínez Bravo was a music theorist and organist born in Madrid. One of his major contributions to Iberian music was the establishment of the first printing press on the peninsula. With the continued exile of Durón, Torres took over his job as master of the choir for Philip V of Spain, a post he held until his death. Many of his compositions are found in the Guatemalan archive, which include four- to eight-part villancicos, solo cantatas, and larger works such as A la misteriosa cena, based on an obscure text referring to the Last Supper with parts for oboe, violin, viola, four-part choir, and continuo. Juan Gutiérrez de Padilla was arguably the most talented and influential composer of the 17th-century colonial period in Latin America. He was born near Málaga, Spain, and moved to Mexico in 1622, becoming assistant maestro de capilla at Puebla Cathedral. Seven years later he was appointed maestro de capilla at the Mexico City cathedral and stayed in that position until his death in 1664. Juan de Araujo, the most important 17th-century composer in La Plata, Bolivia, was born in Spain, moved to Peru as a child, and studied at the University of San Marcos in Lima. He was maestro de capilla at La Plata Cathedral from 1680 until his death in 1712. Almost 200 of his works are in the Guatemalan archive, and five more are in the archive of the Seminary of San Antonio de Abad in Cuzco, Peru. He wrote sacred and secular vernacular works of excellent quality, including Latin psalms, hymns, partsongs, and polychoral villancicos. Born in Puebla, Mexico, Juan García de Zéspedes was a Mexican singer, viol player, and composer. He was appointed as a soprano at Puebla Cathedral in 1630 under the guidance of maestro de capilla Juan Gutiérrez de Padilla, whom he succeeded in 1664. His compositions ranged from secular pieces inspired by folk music to sacred works. Convidando esta la noche, composed in Mexico City around 1640, captures the vivacious spirit of the Mexican villancico with the guaracha, which is a dance of African origin based on the habañera rhythm. This piece, along with Araujo’s Los coflades de la estleya, exemplifies the unique mixture of African rhythms with European counterpoint that was so popular in 17th-century Latin America.